Palestine Legal, the Center for Constitutional Rights (CCR), and San Diego National Lawyers Guild (NLG) wrote to San Diego State University (SDSU) today to demand that President Hirshman cease defending the David Horowitz harassment campaign, and start defending SDSU students. In response, SDSU’s President Hirshman made three separate statements that failed to denounce the posters. 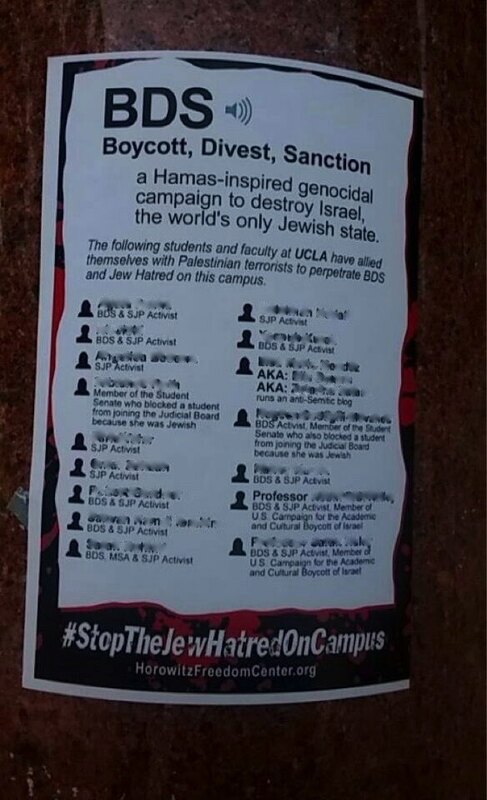 Hirshman implied the posters’ defamatory accusations were merely criticism that students brought upon themselves, and stated that BDS supporters share a “common goal” with terrorists. Hirshman’s statements produced a student outcry. [T]he University’s actions … send the message that the administration condones and concurs in Horowitz’s defamatory message, as well as condones harassment based on race, national origin, and shared ethnic characteristic at SDSU. The posters’ accusations are unequivocally false. As Palestine Legal has documented extensively, baseless accusations of antisemitism and terrorism are a cornerstone of efforts to suppress campus debate about Israel. The recent posters naming individuals are an escalation that educators must denounce. See Palestine Legal’s letter to SDSU here. See Palestine Legal’s letter to UCLA regarding Horowitz posters here.